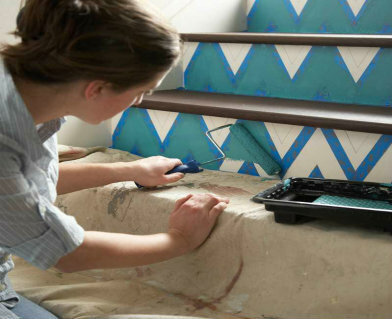 Painting your steps is a great way to update your staircase. It is easy and you can add your own personal touch. If you are painting over raw wood or concrete, make sure to use a primer before applying any paint. What we have here is a chevron pattern on stair risers. Here is a step by step guide on how it’s done! Enjoy! First, chose two colors that you will use to create this look. You’ll want to start by painting your stair risers with the lighter of the two colors, in this case, white. Apply two coats if necessary and allow the last coat to dry for at least 24 hours. The easiest and most time efficient way to create a chevron pattern is by using 3” painters tape. Draw the pattern out first with a ruler and make sure it’s even. Following your pencil lines, tape off the inside of the triangle. Paint over the tape with your roller. Make sure you don’t overload the roller. If you do the paint will bleed through the tape. Remove your tape, and touch up any imperfections with your artist brush. If you are feeling crafty you can make a stencil! Just as in option 1, the first step is to chose the two colors that you will use to create this look. 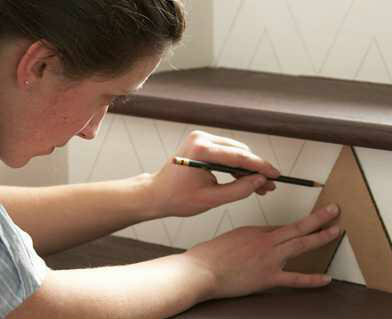 You’ll want to start by painting your stair risers with the lighter of the two colors. In this project, we chose a chevron design, but you can make your stencil in whatever kind of pattern you like (Polka dots, stripes, checkers, diamonds, etc.). You can also purchase ready-made stencils in the paint department of your local Home Depot. Draw the pattern onto any heavy material to make your stencil. 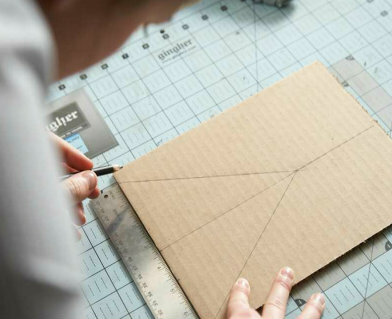 Cardboard, card stock, or heavy plastic are just a few materials that would work. 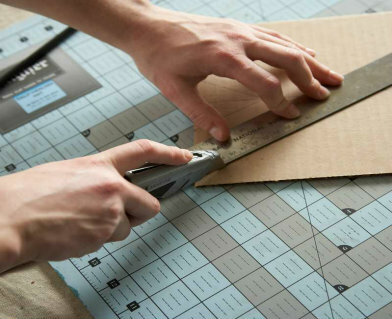 Then cut out your pattern using a hobby knife and ruler. 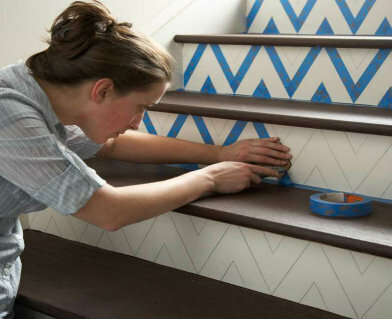 Trace your chevron pattern on to the stair risers. Paint on your chevron pattern. Use painter’s tape to block off the traced area. Put the tape on the outside of the traced area so that you can paint within the lines of the pattern. Trim off any excess tape with a hobby knife. After you are satisfied with your pattern, roll on your desired color. Repeat the above steps for each stair until your project is complete! Chevrons can go anywhere, not just stairs. You can paint them on the front of a dresser, on a headboard or even paint them on a wall as an accent wall. The possibilities are endless! Go forth with this knowledge and decorate! Do you have any specific details on the paint colors used (both on the stairs and the door)? I can't wait to put this design into my foyer! It would really spice up a staircase and it's so simple that everyone could do it. I agree with Christine that you should used the 2" painters tape so it would be nice and even. If you used 1" it might be difficult to make all of the lines match up perfectly. I can't wait to see some of your staircases all jazzed up. If anyone does this to their staircase post some pictures. I'm sure I'm not the only one on the community that would love to see it. 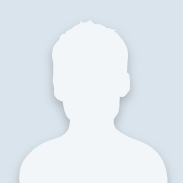 Welcome to our community DIYers! Thank you so much for posting your handy-work! They look great! Please feel free to post any tips and techniques about this project. We look forward to seeing what else you can do! Is there anything that can be painted over the design once finished to keep the stairs from getting scuffed up, knicked, etc. from all the foot traffic? like a shellac or varnish. I would love to do this, but my kids are hard on everything and I am afraid it would look terrible after a few months. I've used a water based urethane finish over painted surfaces and it's worked pretty well to protect the surfaces. It comes in a couple different sheen levels. Hi, If you use the Scotch Tape for wrapping etc. the "Magic Tape" will give you the best edge for creating any type of graphic, or you could cut "Frisket" paper, trick is to press down edges with plastic putty knives and leave on until completely dry, FYI!!!! We loved this project at our house! The gold paint is Martha Stewart's craft paint, available at Home Depot. Those stairs look amazing! = D Your technique is spot on with those and quality definitely shows! Thanks a bunch for sharing them with us, hopefully this will inspire more people to take on this project. Be sure to share any other projects you might happen to tackle around the home, we'd love to see more.